After a dismal five years of declining lumber markets, forest companies and sawmills are starting to crank up production, primarily to meet growing demands for lumber in the Chinese market. Logging and Sawmilling takes a look—with the help of Canada’s largest wood products consulting firm, International WOOD MARKETS Group Inc.—at lumber production numbers in this issue, with the authoritative list of Canada’s Top 10 Lumber Producers. The forest industry in Canada’s largest wood basket—the B.C. Central Interior—is working its way out of the doldrums, and there are now regular mill re-openings. But the result has been a labour shortage in the bush and at the sawmill. Logging contractor—and ex-hockey player—Wade Fournier brings all the right ingredients to the table, starting with a modern equipment fleet and unique skills, particularly experience operating tilter feller bunchers and knowing how to safely harvest timber on steeper ground. Armand Landry’s dream of producing a purpose-built tracked harvester has come true with the development and production of the Landrich harvester—and four of these very efficient and productive harvesters are now at work in New Brunswick and Quebec. In British Columbia, a pilot project using a solar hybrid kiln to dry lumber has delivered good results—and offers the potential of savings for a forest industry that is always looking to cut its energy costs. Logging and Sawmilling Journal’s authoritative ranking of Canada’s largest lumber producers—who’s up and who’s down in lumber production. 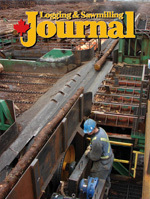 Logging and Sawmilling Journal has the latest information on what’s new with skidders in this issue’s Tech Update. It’s time to jump-start the B.C. Forest Service—not bury it, says Jim Stirling. It’s not like it once was but it’s better than it has been. The forest industry in Canada’s largest softwood lumber producing region is climbing from the doldrums and re-aligning itself to meet the challenges of manufacturing different wood products for a broader range of emerging world markets. And, as a result, there’s a mix of positive and negative signs evident throughout British Columbia’s Central Interior. Sawmills are re-opening. Not every day and typically just on a one shift basis, but the trend is positive. The sustained demand for wood products from Asia is frequently a contributing catalyst for keeping mills operating while the U.S. market remains at a low ebb. The mill re-openings generate much-needed cash flow for sawmills and their workers, equipment companies, loggers and truckers and on throughout the supply chain and into the region’s forestry-dependent communities. The big boys are announcing planned mill investments, although they’re not accompanied by a timeline. West Fraser Timber has a capital spending program of up to $230 million throughout its operations. Canfor Corporation, which posted a $161.3 million profit during 2010, has a $145 million capital spending plan for 2011. Included in that are regional sawmill upgrades at its Bear Lake Polar Sawmill and Plateau Sawmill near Vanderhoof. On a recent Saturday, the Prince George Citizen newspaper carried career ads for eight regional forest companies along with two openings at a Prince George equipment dealer, from a forest engineering group and a logging company. The ads illustrate what’s long been predicted. The labour shortage facing the regional forest industry has arrived. As log harvesting activity increased during the 2010-11 winter logging season, so did loggers’ laments. They couldn’t find qualified people to operate their equipment. The situation with logging truck drivers seemed particularly acute. There was confirmation of that from MaryAnne Arcand, executive director, member services for the Central Interior Logging Association (CILA) based in Prince George. 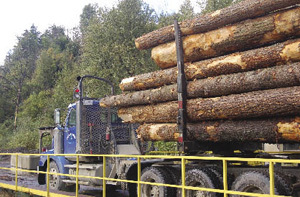 The qualified labour shortages are being experienced across the board in the regional logging sector but are most severe in the trucking sector. “The town of Mackenzie is 60 logging trucks short,” Arcand was reporting in late February. A similar situation was being experienced in Valemount and Williams Lake and most other logging towns across the region. It was not just a qualified driver shortage that was grounding log hauling activity. “Tires are another problem. In fact, there’s a shortage of just about everything in the supply chain,” adds Arcand. The CILA staff and directors have come up with ways to help alleviate the situation in the longer term. “There is no fast solution,” states Arcand bluntly. “We’re working with First Nations groups to get a mentoring program on the ground,” she says. A pilot program for log truck drivers is a first step. First Nations frequently have access to training funds, she notes. The initiative is not without its challenges. First Nations drivers, like other drivers with no experience, face higher costs, including those for insurance and WorkSafe BC. Another direction being pursued by the CILA is developing programs to encourage more women to consider working in the log harvesting business. Arcand says the CILA is working with groups like the Council for the Status of Women. As with inexperienced log truck drivers, there are issues with attracting more women to participate in male-dominated work areas like log contracting. In other parts of the forestry world, women have proven adept and efficient equipment operators, especially with machines like harvesters and feller bunchers. Arcand says job sharing models are being examined for women, to better balance family and work responsibilities. On a different tack, Arcand notes the CILA is beefing up its benefits package to better retain the workers it still has. She says it’s tough to get an accurate handle on how many truck drivers and logging contractors have been permanently lost to the regional forest industry. “A lot of the little guys, those without much equity in their equipment, couldn’t survive in 2008 and 2009,” she says. And then there’s competition from other resource industries with the seduction of higher wages and longer working seasons, highlighted by the oil patch. The mining industry is now proving a formidable competitor for available skilled manpower and equipment. Some loggers have already moved their equipment to help clear the mine site for Mt. Milligan, a $900 million gold and copper open pit operation about 155 kilometres north of Prince George, and close to both Mackenzie and Fort St. James. Both of those forestry communities have real concerns about the mine’s impact on its forestry operations. Mt. Milligan is operated by Thompson Creek Metals Co Inc and anticipates a construction work force requirement of 200 to 600 workers and 400 full time jobs for at least the next 15 years. COFI has managed to sustain its forest industry career awareness programs in high schools in Prince George and Kelowna. In Prince George, for example, these forest education programs explain further education options available at the College of New Caledonia and the University of Northern British Columbia. It’s an eye-opener to students to realize what a highly technical sector today’s forest industry has become, observes Routledge. On the other side of the ledger, the demand for regional lumber from China has been a positive feature this winter.”It’s not so much a huge increase in total volume and hours as it is that no (mill) has had to curtail operations,” explains Routledge. One of the “emerging bright spots” has been the increase in demand for grade two and better material in China and Japan. Incorporating those wood qualities into roof trusses and items like interior walls in hybrid Chinese buildings are examples of grade two and better usage. “We have to find ways to fit our material into their building systems,” points out Routledge.